"When my 4 year-old was done washing the sliding glass door in the kitchen this morning he proclaimed (rather stubbornly) "I WANT ANOTHER SUMMER JOB!" Although it made me chuckle, it also made me happy. Kids like being busy, helping, being a part of 'progress'." 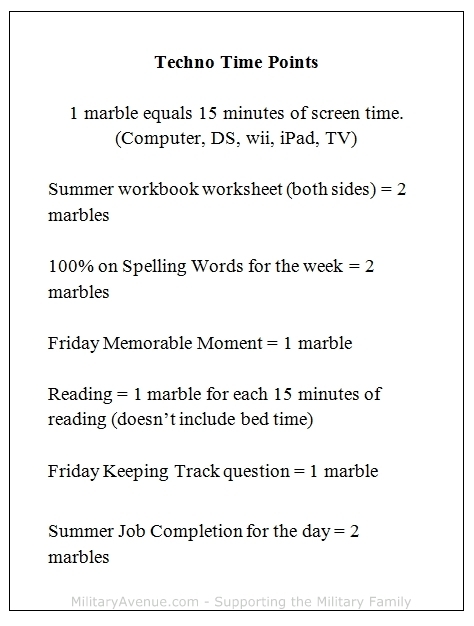 So to balance the screen time, summer responsibilities and just plain old fun in the sun time we are instituting a marbles for screen time program. I printed out the Techno Time Points and hung it on the frig and then I bought two small vases and a bag of marbles. Last night as my boys and I discussed our new summer program they lit up with excitement. There was no grumbling or 'mean-mommas'. The thought of being rewarded for hard work seemed to be a great motivational tool. Some of the marbles that can be earned are specific to the Evan-Moor books so if you decide to start a points system like this you will want to modify it to your needs. How will you balance life with school aged children this summer? I can't wait to dive in and enjoy the ride!